For many years perfumes from the Hermès house were completely out of the sphere of my interest. I tried some of them on several occasions but didn’t find them attractive. Then one day I smelled Rocabar and it became my favorite men perfume for years. I never wore it myself but I loved it on my vSO. Because of that affection for Rocabar I decided to give Hermès another chance (not that it was begging for it). Unexpectedly I discovered that I grew fond of Un Jardin sur le Nil. If I were to name my favorite perfumes (and I still plan to do it in the nearest feature) Un Jardins sur le Nil would not probably make it into my Top N list. But my bottle has less than a quarter left in it and as it gets warmer I catch myself thinking about it more and more often. Over the years I approached both Un Jardin en Méditerranée and Un Jardin apres la Mousson again and again and consistently didn’t like them. I do not know why I kept trying: with most other fragrances I give up after a very limited number of attempts, but with these two I was insistent. A month ago I sprayed Un Jardin en Méditerranée on a blotter and liked it. I’m still building up the courage to test it on skin: I do not have that perfume’s sample at home but every time I come by it in a store I’m either wearing something else or have other plans that do not involve having access to hot water and soap (in case the experiment doesn’t go well). But I will get to it eventually. Un Jardin apres la Mousson still leaves me absolutely cold. The newest Jean-Claude Ellena’s creation for the Gardens series started for me as an idea: I read an article on the upcoming release and liked the mental picture I formed in response to that news. I should admit that Paris wasn’t in that picture. 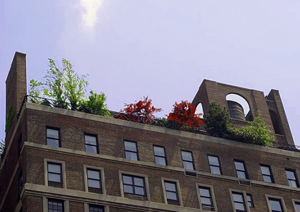 For some reason garden on the rooftop in my mind is strongly associated with New York. An apple note in Un Jardin sur le Toit’s description made this association even stronger (an apple – Big Apple – NY) but at the same time it made me wary of how this note would be crafted into the perfume (Big Apple – Be Delicious – Ugh! ).